Johannesburg (South Africa) – Just one week remains until the most dangerous man on the continent, heavyweight champion Ruan ‘Fangzz’ Potts, clashes with iron-jawed Andrew ‘One Gear’ van Zyl, in the highly anticipated rematch for Africa’s most coveted belt. 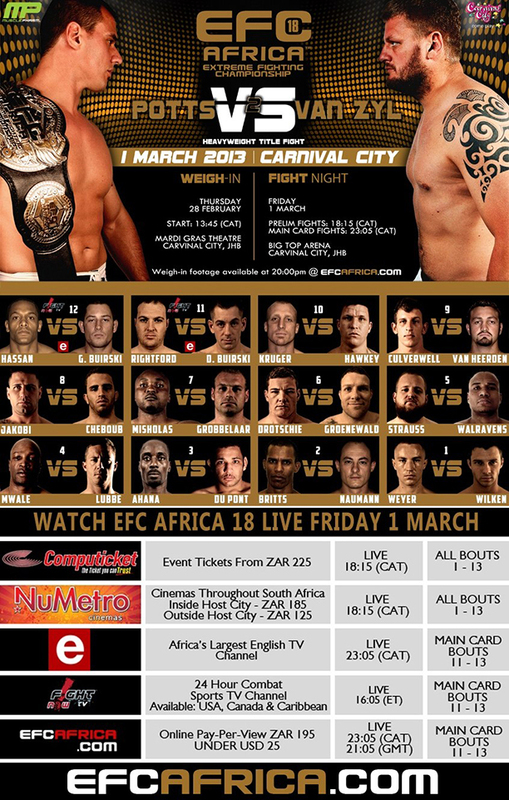 Africa’s MMA calendar kicks-off with EFC AFRICA 18, presented by MusclePharm, on 1 March at Carnival City. Get the adrenaline pumping for fight night by watching the live weigh-in, taking place at the Mardi Gras Theatre at Carnival City on the 28th of February. Entrance to the public is free, and weigh-in will start at 13:45. Come and support the athletes and feel the tension as they stare-down for the biggest MMA event of the year.